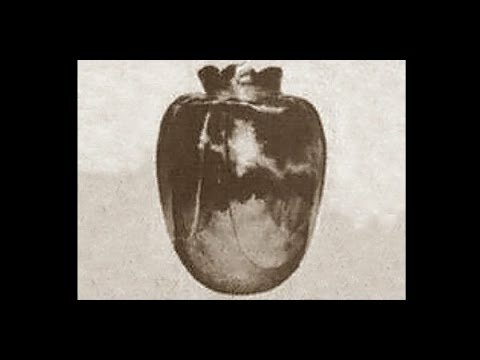 Here I have researched 15 items that are alleged to be haunted by something, someone or which have an alleged curse attached to them. All these items are from across the world and some are more known then others. Have a read through, check out its history and let me no which items you think are the Most Haunted Items in the world. 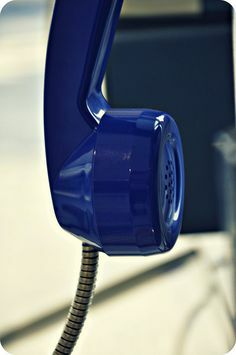 The Number +359 888 888 888 has somewhat been given the name the cursed phone number. Everyone who has had this number since it was first issued in the early 2000s has died. This includes the CEO of a Bulgarian mobile phone company, who died of cancer at the age of 48. Two crooks, one a mafia boss and the other a cocaine dealing estate agent, both gunned down. All three died within four years of one another. The number now has been suspended and the company who owns it has refused to comment as to why. It is said that this silver vase made in the 15th century was given to a bride on the eve of her wedding. The bride to be was to wed near Napoli, Italy, but sadly she never made it to the alter as she was murdered that night with the vase in her hands.The vase was passed down the family line, but it was said that everyone who had it in their possession died soon after receiving it. The vase was boxed up eventually and stored away until it resurfaced in 1988 with a note that read ‘Beware…This vase brings death’. The vase was auctioned off for $2,250 and was sold without the note and the warning in the description. A pharmacist who brought the vase died within 3 months and three more deaths followed of its new owners. Finally the family demanded that the police take it away, which seemed to tame the curse. The vase has not been seen since. The puppet came from a man, who wished to be name John, he said that he inherited the puppet after his father passed away.He believed that spirits had attached themselves to the doll and stated that one night he awoke to the sensation of being choked but previously to this had nightmares of an old man. John stated that after this incident, he contacted Jayne Harris and since passing the puppet over to Jayne, him and his wife feel much safer. The puppet is placed in a glass case and is blessed with holy water. Jayne studied and worked with the puppet for 3 months, where nothing really occurred but one night to Jaynes excitement on reviewing footage Jayne spots the puppet move. 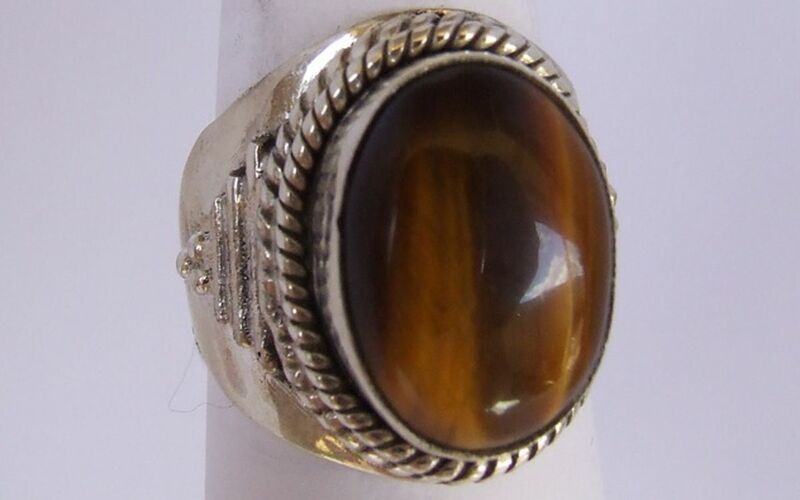 Rudolph Valentino, one of the greatest silent actors of all time, brought this ring in the 1920s. Rudolph showed his ring to a friend, who instantly pictured an image of a corpse. Rudolph dismissed the premonition but from that day came a string of bad luck. His career flopped and soon after wearing the ring Rudolph died. His lover, wore the ring and became mysteriously ill. A writer wrote a biography of Rudolph’s life and decided to wear the ring and died shortly after. Years passed and a man named Jo Casino purchased the ring. Several years pass and it was thought the curse may have been lifted. Jason decided he wanted to wear the ring and died a week later! Jacob Cooley a slave owner, ordered one of his servants to make a chest for his son. 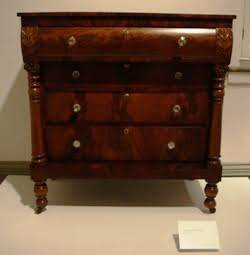 The slave Hosea made a beautiful chest and presented it to Jacob. Jacob was not impressed by it and beat Hosea to death. Jacobs other slaves, friends of Hosea, planned revenge on Jacob and planned a ritual and got a ‘conjure man’ to place a curse upon the chest. Jacobs first born son died and it is believed the curse may be responsible for 17 other deaths. Its believed that the curse as since been lifted from the chest and the chest can be viewed on display at the Kentucky History Museum in Frankfort. 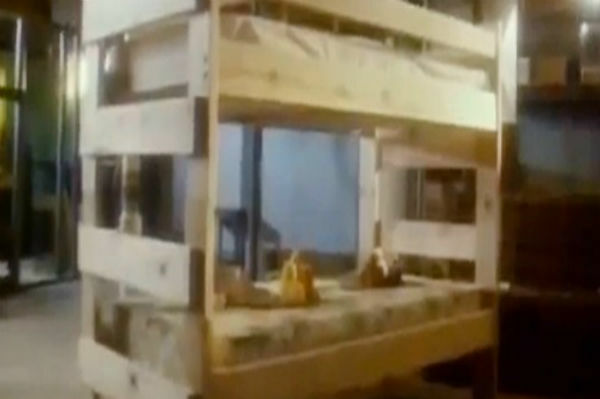 In February 1987, Alan and Debby Tallman purchased bunk beds for their children. The bunk beds was stored in their basement for some time until they could be moved upstairs. For the 9 months the bunk beds was in the house a series of strange occurrences happened that the family just could not explain. The radio would change stations, the children became ill and stated they had seen witches. The family brought a pastor into their home to cleanse the house and even though the activity did seem to tame down for a short while, it didn’t take long before it started once again. Alan claimed he came home one day to hear a voice beckoning him into the garage saying ‘come here’. When he approached he seen that the area was on fire. He ran out and got a fire extinguisher to return to find that the fire had disappeared. Alan decided to burn the bunk beds and stated that once gone the activity stopped. In 1972 Bill Stoneham, an artist from Oakland, California used an old photo of himself from the age of five, to be the model for the boy in the painting. The boy is either looking to the future, or the viewer is looking back into their past. The hands seen in the windows are other potential routes and possibilities his life path may have taken, or other potential lives that may have been, but he does not see them, his back is turned. The little girl doll is his guide through life, though she is holding a piece of herself, a battery and some wires. Finally, the glass door is a veil between waking and dreaming, and perhaps between life and death. The painting was first displayed at Feingarten Gallery in Beverly Hills, California in the 1970s. The painting was purchased by actor John Marley ( Jack Woltz in The God Father). Sometime after Marley’s death the painting was found on the site of an old brewery. 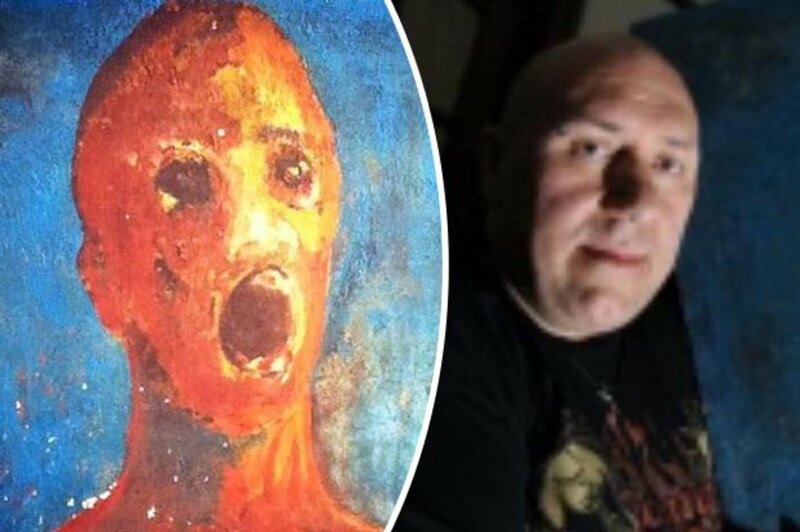 An elderly couple found the painting and put it on Ebay in February 2000, according to them they believed the painting had some sort of curse. They claimed that the characters in the painting moved during the night, and that they would sometimes leave the painting and enter the room in which it was being displayed. Also included with the listing were a series of photographs that were said to be evidence of an incident in which the female doll character threatened the male character with a gun that she was holding, causing him to attempt to leave the painting. A disclaimer was included with the listing absolving the seller from all liability if the painting was purchased. Some people claimed that simply viewing the photos of the painting made them feel ill or have unpleasant experiences. Eventually, the auction page was viewed over 30,000 times. After an initial bid of $199, the painting eventually received 30 bids and sold for $1,025.00. Eventually Bill Stoneham was contacted was told the story of it. He reported being quite surprised by all the stories and strange interpretations of the images in the painting. According to the artist, the object presumed by the eBay sellers to be a gun is actually nothing more than a dry cell battery and a tangle of wires. Stoneham recalls that both the owner of the gallery in which the painting was first displayed, and the art critic who reviewed it, died within one year of coming into contact with the painting. 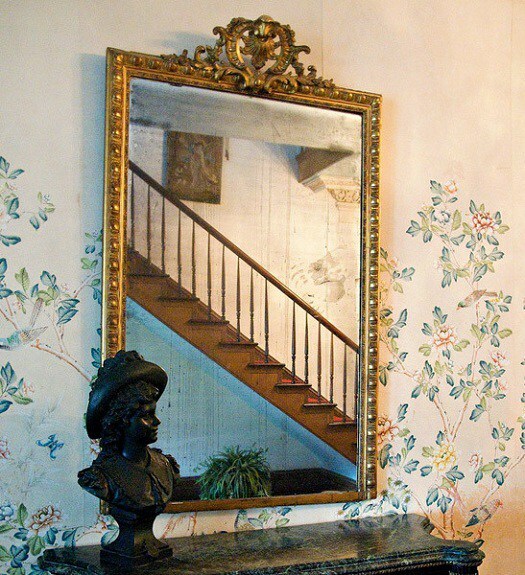 Claimed as ‘one of America’s Most Haunted Home’ the Myrtles Plantation in St Francisville, LA, is also the home of the alleged haunted mirror. Dozens of legends surround the historic property and the tales of the haunted mirror is properly one of the most famous. It is thought that a slave named Chloe baked an oleander laced cake for the Woodruff family. Its believed that Chloe poisoned 3 members of the family, Sara, the lady of the plantation, and her two daughters. Many believe that Chloe didn’t mean to kill and only insisted on making them ill. Its believed that Sara and her two daughters are trapped inside the mirror. The 217 year old plantation has had many reports from visitors, which include handprints on the glass, prints believed to belong to Slain Woodruffs. Strange drip like marks running the length of the mirror and not being able clean and remove residue. Figures have also been spotted inside the mirror in old fashioned clothing. Even though it may seem something strange may be occurring with the mirror, plantation records show no record of a slave name Chloe and one of the Woodruff daughters survived well into adulthood. The other perished from yellow fever as well as Sara. 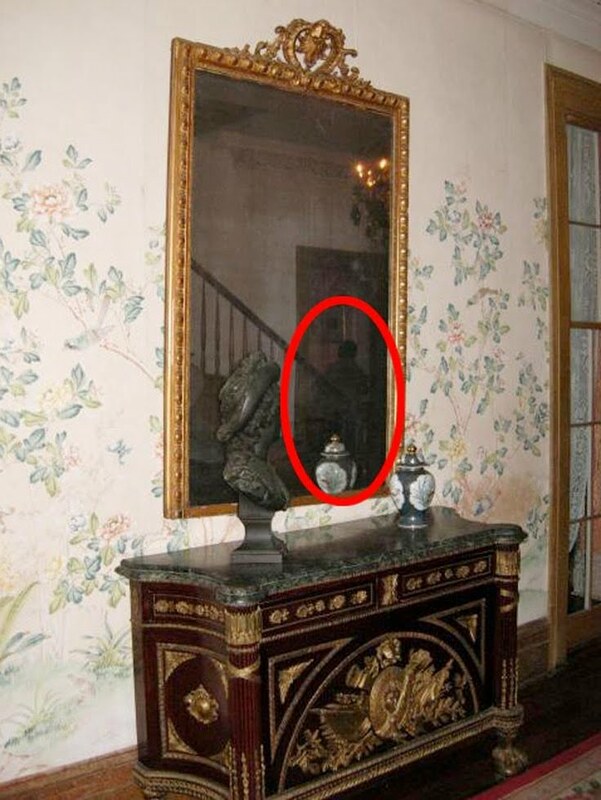 Pictured below is a ghostly figure caught in the mirror. The Busby Stool also known to many as the ‘Chair of Death’ and the ‘Cursed Chair’ is allegedly a haunted oak chair and is said to be one of the most haunted items in the world. It is said that the curse was put on the chair by the Murderer Thomas Busby before his execution by hanging in North Yorkshire. Busby was arrested, tried and condemned to death after he murdered his father in law Daniel Auty in 1702. The execution’s site which was opposite and was renamed The Busby Stool Inn, It was said to be haunted by the Busby Ghost also but unfortunately the pub isn’t here to this day and a takeaway stands in its place. Even though this isn’t thought to be the actual Busby Chair that Thomas Busby would have placed a curse on as it is believed this one would have been made around the 1800s , This chair has somehow been given the name and has been given the reputation of that the original would have had, as it has also been alleged to have caused deaths of those who haddared to sit within it at The Busby Inn. It is unknown what may have happened to the original chair. Two Young airmen sat in the inn one night daring each other to sit within the chair. Eventually one of them caved in and placed his bum within the chair for a second. On their way back to the field they both died in a traffic accident. Post world war II a young builders apprentice died soon after having lunch at the Inn. His workmates had dared him to sit within the chair, which he did and later that day fell through a roof of a building and died. A delivery man sat in the chair while it was stored away in the cellar after enquiring about the legend. He died in a car crash that evening when he lost control of his car and it crashed killing him sometime later. Many airmen from the nearby airfield lost their lives after having sat in the chair. It was said all who did would not return home from the war. A chimney sweep man who sat in the chair within the Inn after having a few drinks, left the Inn at some hour of the night/early hours of the morning and didn’t managed to get far. He was found hanging from a gate post next to the mock Busby Gibbet which is located next to the Inn. A report into his death decided that this gentlemen had taken his own life. In 1836, Elias Baker, a ironmaster, purchased a mansion near Alleghany Furnace in Altoona, PA.
Elias and his wife and two sons moved in and later on Hetty, Elias wife, had their third child Anna. Stories tell that when Anna reached marrying age, she fell in love with a local man who was a steelworker.They got engaged in secret and Anna got herself a beautiful gown ready to wear for her wedding day. Her father, Alas, discovered Anna’s plan and forbid Anna to marry the man she so deeply loved. Alas thought the man was too low class for Anna and demanded it to be called off. The wedding dress never got worn and Anna died in 1914 marrying nobody. 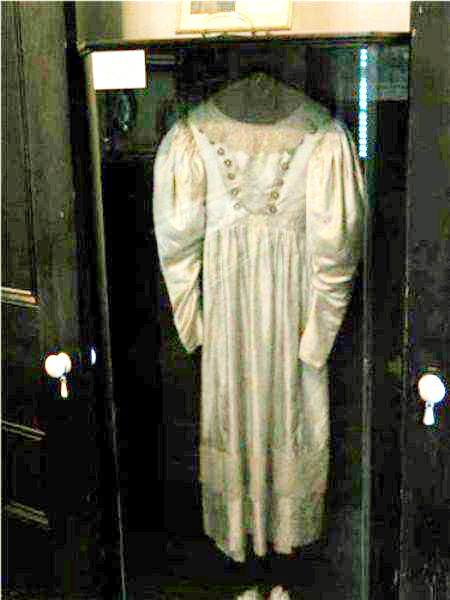 The gown remains on display in the Bakers Mansion and historic house museum in glass casing. It is claimed that the dress would often appear to dance all by itself, its sleeves fluttering and the matching shoes tapping. The Bakers mansion itself it reputed to have many sightings that of Anna, Elias, Hetty (Anna’s mother) and David (Anna’s younger brother). According to researchers the dress was worn by Elizabeth Bell in 1830. Bell the daughter of an iron master, Edward Bell. So the claims that it had never been worn are debunked, but whether the story of Anna and her Lover are made up it still doesn’t dismiss the claims people have made with reporting the dress moving. Previously sent to Jayne Harris (Paranormal investigator and Haunted collector) by a lady who reported a series of terrifying nightmares. She claimed that she would wake feeling hot and shaken and no matter where the doll was within the house the nightmares still continued. The lady asked for help from her local priest but two visits on and there was still no change. In September the lady became quite ill with a fever and began suffering hallucinations.When recovered, the lady decided she needed rid of the doll and convinced herself all the goings on was to do with the doll. The lady sent the doll to Jayne as she didn’t want any kind of experiments conducting in her home. Jayne posted videos and photos of peggy and many people came forward after viewing and suggested that Peggy had affected them in some way. Many described having chest pains, nausea and headaches. Some even reported flashing visions of mental institutions and feelings of abuse and anxiety. One lady even claimed to have suffered a heart attack straight after viewing. Jayne herself even stated she experiences migraines and feeling drained after working with peggy. 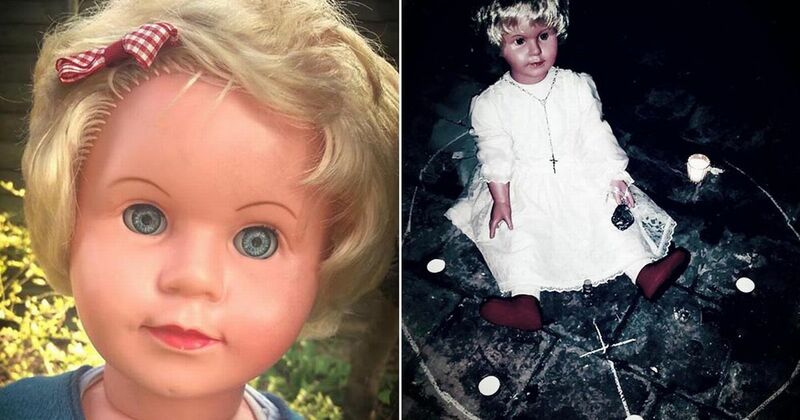 It is thought that the doll is possessed by two spirits a women named Peggy and a male. Four different psychic mediums have read ‘Peggy’ and the overall feel is that she is restless, frustrated and was persecuted in life. The male is thought to be nasty and evil and the root cause for the negative affects it has on people. Others have stated that they feel she has possible links to the holocaust and may be jewish. In April 2016 Peggy featured on ‘Deadly Possessions’ with Zak Bagans, during this there was some unexplainable occurrences. While interviewing Jayne, Zak had flies landing on his face while discussing Peggy, which he stated had never happened before. While Zak was debating whether or not to view Peggy the camera suddenly stopped recording. 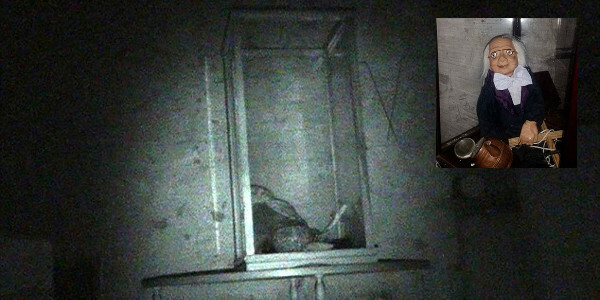 Now Peggy is residing in Zac Bagans Haunted Museum in Las Vegas. In England, 1985, a series of bizarre fires broke out, destroying many homes and businesses. The link between the fires was a collection of paintings, known as ‘Crying Boys’. Out of the devastation of each fire, only the paintings would survive, and soon, they would be labelled as ‘cursed’. Bruno Amadio, an academically trained painter, was working as a painting restorer in Venice, when he created his series that became known as ‘Crying Boys’. These paintings, of which at least 65 were made, all featured young boys, who stared straight out of the picture, with tears welling in their eyes and rolling down their cheeks. The pictures were created for tourists visiting post world war two Venice, the significance being that the paintings showed the sorrow of the children who had been recently orphaned due to the war. Eventually, some of these paintings were brought to England, mass produced and sold in shops and department stores at a cheap price. More than 50,000 copies of the paintings made their way into people’s houses all across England. In September 1985, British newspaper ‘The Sun’ ran a report on some strange happenings surrounding the Crying Boy paintings. The article told the story of Ron and May Hall’s home of 27 years, in Rotherham, which was destroyed by a devastating fire. The fire was started when an unattended frying pan caught a light and the house went along with it. The strange thing was that only one item seemed to have survived the blaze. Found amongst the ashes and ruin was a frame, the painting within was face down on the floor, and only slightly scorched. The Crying Boy had survived the fire somehow. Ron Hall’s brother was a fire-fighter, and he told how several houses had burned to the ground, and that the sole remaining item was a copy of The Crying Boy, found intact, lying face down on the floor. He also insinuated that fire-fighters believed the painting to be cursed, and that none would hang the picture in their homes. One fire station officer Alan Wilkinson had logged more than fifty ‘Crying Boy’ fires. With The Sun’s large reader base, and the fact that more than 50,000 copies of The Crying Boy were hanging in British homes, a fear in the curse quickly spread. Many readers told their stories through the paper, and various other papers around the country. The story was always the same, soon after the picture found its way into a home, a fire broke out, destroying everything except the picture itself. Several readers also wrote in, explaining that after they had read about the curse, they attempted to destroy their copies of the paintings. They attempted to burn them in their garden incinerators, but the painting failed to burn. Soon after a ‘Crying Boy’ fire had gutted an Italian Restaurant, The Sun ran a story encouraging readers to send them their copy of the paintings, if they felt fear from the curse. The sun organised mass bonfires for the burning of the paintings, and soon over two thousand had finally gone up in flames. Although they were not easy to burn, they did eventually succumb to the fire and flames. Soon other methods for lifting the curse of the painting came to light, such as handing the painting to another (thereby giving them the curse), or hanging the picture alongside a painting containing a crying girl. The stories of the fires began to smoulder, and the series of events relegated to the status of legend. However, the question still is If the paintings were indeed somehow causing or enabling fires to take place, what force could be behind it? There are several stories behind the legend of the painting itself. One states that the models for the various crying boys were orphans who, soon after the paintings were completed, died in an orphanage fire. Another version is that Bruno Amadio, also known as Bragolin, had fled to Spain soon after the end of World War Two. Here Amadio met a young boy named Don Bonillo, a mute orphan who had seen his parents perish in a house fire during the war. Amadio soon adopted the boy, although he was warned off of doing so by a local priest, the boy being the centre of many mysterious fires that broke out wherever he went. The boy was known locally as the devil child. Amadio refused to believe such stories, and the new family did well, Amadios paintings were selling well, and the two were living easy. Unfortunately, one day Amadio found that his house and studio had burned to the ground. Remembering the priest’s warnings, he immediately blamed Don and kicked him out of the family. Don Bonillo was not heard from again until 1976, and surrounding another bizarre event. Just outside of Barcelona a car smashed into a wall and burst into flames. The driver was killed and was so horrifically burned; he was not able to be identified. However, upon investigation back at the police yard, the glove compartment was pried open. There, among burned items, was an untouched driver’s license. The name on the license was Don Bonillo. 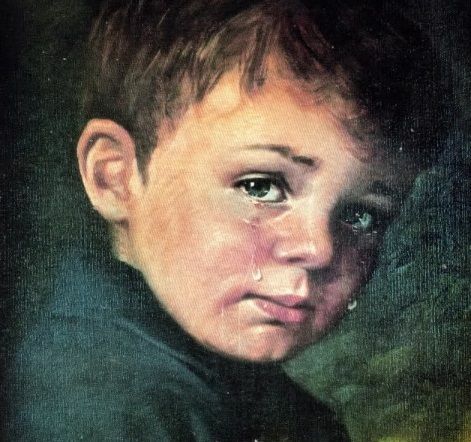 It is said all of Amadio’s paintings of crying boys were cursed by the memory of Don Bonillo. Unfortunately, all of the facts of this story cannot be 100% confirmed. Bruno Amadio, the painter, died in 1981, the truth of this story has also gone with him. Robert the doll who’s face is vaguely human, His nose looks like a pair of pinholes. Covered in brown nicks, which appear like scars. His eyes black and beady and he wears a malevolent smirk. Robert is known to be one of the most haunted dolls in the world and even inspired the film Chucky. Where Robert the doll actually comes from is much disputed, stories of its origins gets passed around but the story goes that Robert was given to Thomas Otto son Robert who lived on a plantation. The Ottos was known to have servants, which they often mistreated. HaitianDue to such treatment of one such Haitian Servant is where this story begins. This lady was supposed to look after Robert, one day Roberts mother caught the servant practicing black magic in their backyard and fired her. Before leaving its believed the servant gave Robert a life size doll, which was 3 feet in height, had buttons for eyes and human hair (believed to be Roberts) and was filled with straw. Dolls often resembled children during this era, so this was not unheard of. 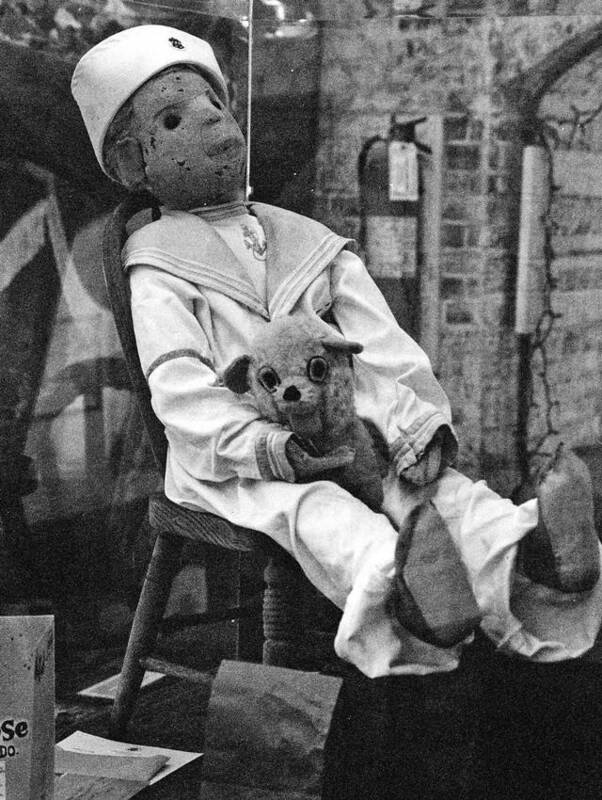 Robert named the doll after himself and often dressed him in his own clothes. Robert the doll came somewhat of a trusted friend to Robert and took the doll everywhere. The relationship between the Doll and Robert took a strange turn soon after. Robert decided he wanted to be referred to by Gene (His middle name). After being scolded by his mother, Robert told his mother that the name Robert was the dolls name and not his. Gene was heard in his toy room often having conversations with Robert. Gene would say something in his childish voice and responses would be heard in a much lower tone of voice. Gene became very agitated which worried the servants and his mother. Robert would also sometimes be found cowering in the corner while Robert was sat perched on a chair glaring over. Household objects would be found thrown across the room, Genes toys damaged and sounds of giggling. Gene would blame the doll claiming “Robert did it”. Gene would take the punishment but always insisted that it was ‘Robert’. Activity grew and the Otto’s relatives felt it was time to do something and decided to remove the doll. Robert was placed in a box and stored in the attic, where he remained for many years. Genes father died and Gene decided to move back home with his new wife. Gene now an artist, felt the house was just what he needed. One day he went in the attic and dusted off his childhood toy. Gene somewhat seemed attached to the doll again despite his wife’s displeasure. Gene once again took the doll everywhere he went. Gene also made sure the doll was nearby on his favourite chair as him a d his wife slept. Slowly their marriage went into disappear and Gene’s wife moved Robert into the attic naming it the Turret Room. Gene’s wife supposedly went insane and died of u known causes as well as Gene shortly after. It was claimed that Robert attacked people, locked people in the attic and that laugher of an evil manner could be heard. Robert remained in the house on his own for sometime, until a new family purchased the mansion and decided to have it restored. Robert was once again moved into the attic. Sometimes Robert was found in other parts of the house, and the icing on the cake was when the family claimed Robert was at the foot of the owners bed giggling with a kitchen knife placed within its hand. The family fled. Robert was then moved to the East Martello Museum in Key west, where he is now. Robert is sat perched in a glass box in his sailor suit clutching his stuffed lion, but despite moving homes it seems that Robert still plays up to his old tricks. Visitors and employees claim to have seen the doll move, his smile turn into a scowl. One of the museums employees accounts that one night, he cleaned Robert, turned the lights off and left for the night. When he returned the next day, he found that all the lights was on and that Robert was sat in a different position to how he left him and a fresh layer of dust was upon his shoes. Some believe Robert can curse you and if you want to take a picture you must ask politely. If he appears to tilt his head this is his given permission to do so, if not and you take one anyway then a curse will befall upon you or anyone you may be with. The same applies if you mock or make fun of him. Around Robert’s casing is letters of apology, of those who have visited and have mocked Robert, the museum receives 100s of letters, emails and messages from visitors offering an apology to him after suffering misfortunes after visiting him. After doing some research to where the doll may actually come from, Robert’s origins trace back to the Steiff Company. The same toy maker that first manufactured a Teddy Bear in honour of Theodore Roosevelt. It may be that Robert was never intended to be actually sold as a toy and would have properly part of a set fabricated for a window display of clowns and Jesters. The Annabelle doll has inspired many films over the years such as The Conjuring (2013), Conjuring 2 (2016) Annabelle (2014) and Annabelle 2 (2017). Annabelle was given to Donna, a student nurse as a gift for her birthday by her mother. Donna’s mother had purchased the doll from a second hand hobby store. Donna was currently living with her friend Angie at the time. At first the doll would only make small movements, which at the time Donna and Angie put it down to accidental, for example placing the doll on the table and finding it on the floor, simple logics suggested that it may have just fell off?.Movements begin to increase though and the doll would move to one place to another. Close friend Lou was nervous of the ragged doll and believed that she was evil, possessed and something needed to be done. Donna and Angie though still remained very logical and believed they somehow was to blame for the movements of the doll. Donna came home one day and found the doll in its usual place upon her bed, on looking Donna spotted that the doll had literal blood on its hands.It seemed to look like blood but whatever it was seemed to be coming from the doll. At this point the women decided to call a medium for some help, to see if they could get answers before things became worse. The first medium to visit told Donna and Angie that the land which their apartment was on used to be a field. She said that a young girl had been found many years before on the land who was about 7 years old. The medium stated that the young girl named Annabelle Higgins and that she still roamed the land and when the doll came into the house Annabelle’s spirit was fond of the doll and attached herself to it. 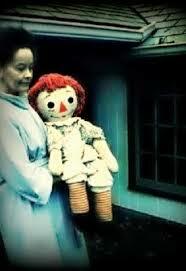 This was the point where the name Annabelle was associated with the doll. Donna and Angie understood and felt sorry for the young girl, they decided to keep the doll and allow they spirit if Annabelle to stay so that she wouldn’t be alone. One day Angie and Lou was spending some time together when they heard movement in Donna’s room. Donna wasn’t in and the pair froze in fear. At first they thought they had an intruder on their hands and went to investigate to find that actually it was the Doll. Lou went to look in Donna’s room and realised that nobody was there, the doll at this point was sat on the chair rather then on Donna’s bed. As Lou moved towards the doll Lou got the feeling that something terrible was about to happen and all of a sudden got a pain in his chest. As he looked a series of claw marks appeared as if someone had leapt at him and scratched him. Nobody else was in the room so the only explanation was that it was Annabelle. The strangest part was that as soon as the scratches appeared they seem to heal straight away and after two days there was no trace of them at all. At this point the Warrens was called in. 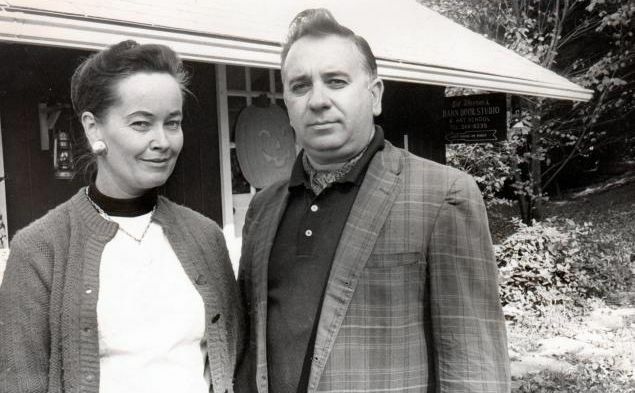 Edward Warren and Lorraine Warren was the first paranormal investigators and demonologists to look into the case. 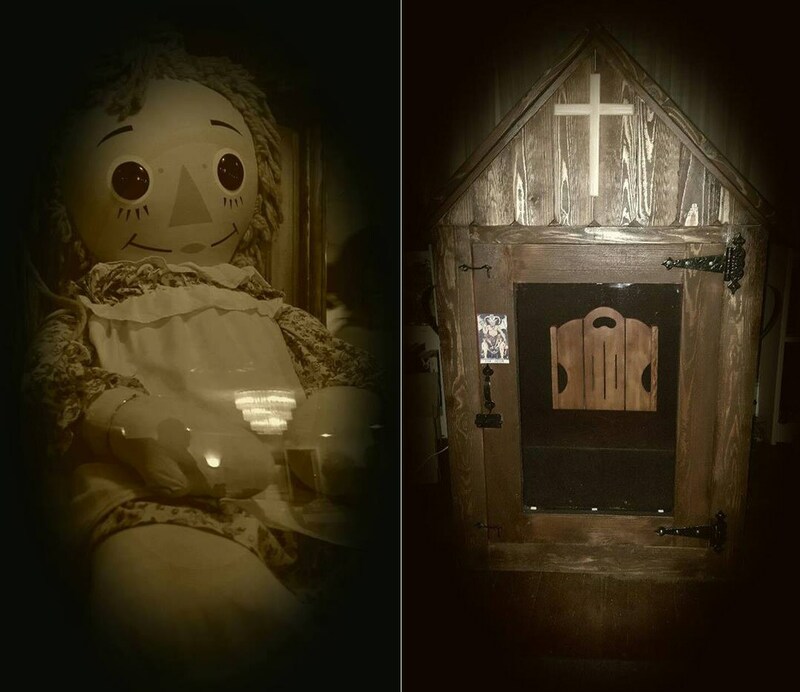 A priest was called into the case by the Warrens and it was discovered that Annabelle was a demon that had attached itself to the doll and its main goal was to take possession of Donna’s soul. The Warrens at this point said that demons don’t possess items or things but did possess people. The priest eventually exorcised the apartment and the Warrens took Annabelle back with them. It was agreed that they would drive home on the back roads to avoid any accidents that Annabelle could cause. On the way home sure enough, the Warrens was struck by many car problems such as their power steering failing, brake failures and the car stalling. Edward sprinkled holy water over the doll which he stated calmed the activity down. When home Edward placed the doll on his desk, thinking it would be safe for a short while. At this point Annabelle was seen rising above the desk, levitating on a number of occasions. Activity slowed down and the Warrens thought that the demon was under some sort of control. At a later date Annabelle was reported to be moving from one room to another around the house. The Warrens decided at this point to call in a priest again, but on visiting didn’t seem to take the case seriously, reporting that Annabelle was just a doll and couldn’t hurt anyone. One leaving the priest was involved in a car accident, where the brakes failed and the car crashed with it resulting in the car turning over. Even though the car was a complete right off the Priest even though badly hurt, did survive. 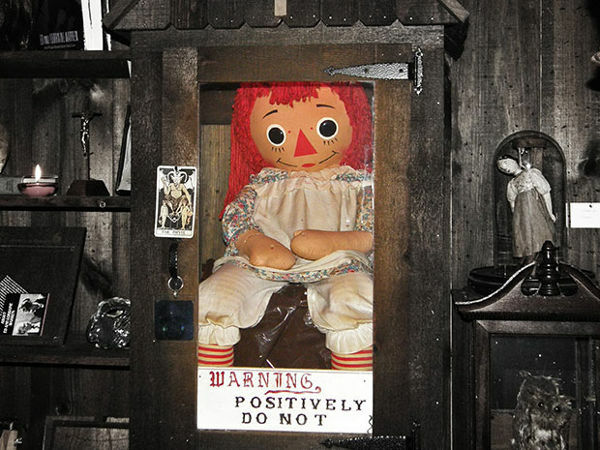 Annabelle is now stored at The Warren’s Occult Museum and this year 2017 was moved from an old casing which stated on it DANGER DO NOT TOUCH ANYTHING and WARNING POSITIVELY DO NOT into a new casing. Kevin Mannis was the first person who created the term the ‘ Dibbuk Box’. He used this term on a eBay auction to describe what he was selling along with a list of paranormal events he related to be connected to the box. Kevin Mannis, a writer and creative by trade, owned a small antiques and furniture business in Portland, Oregon. Kevin story of the box is that he brought it was an estate sale in 2003. It had belong to a holocaust survivor, Havela, in German-occupied Poland. Havela had escaped to Spain and purchased the box before her immigration to the US. Havela’s granddaughter explained to Kevin that the box had been purchased by Havela in Spain after the holocaust. Kevin offered the box back to the granddaughter after hearing this information but the granddaughter insisted that she didn’t want it. She told him ‘We don’t want it’ and that it was kept in her grandmothers sewing room, never to be opened as it was said a dybbuk lived inside it. Kevin decided to open the box and he found two 1920s pennies, a lock of blood hair bound with a cord, a lock of brown/black hair bound with a cord, a small statue engraved with the hebrew word ‘Shalom’ , a small golden wine goblet, one dried rose bud and a single candle holder with four octopus shaped legs. There has been numerous owners of the box who have reported that activity surrounds the box. Kevin wrote that he experienced a series of horrific nightmares shared with other people while they had the box or when they stayed at his home while he had it. His mother suffered a stroke on the same day he gave her the box as a birthday present on 28th October. Every owner of the box has reported that smells of cat urine, jasmine flowers and nightmares involving an old hag with the box. Iosif Neitzke, a Missouri student at Truman State University in Kirksville, Missouri and the last person to auction the box on eBay, claimed that the box caused lights to burn out in his house and his hair to fall out. Jason Haxton, Director of the Museum of Osteopathic Medicine in Kirksville, Missouri, had been following Neitzke’s blogs regarding the box and when he was ready to be rid of the box Neitzke sold it to Jason. 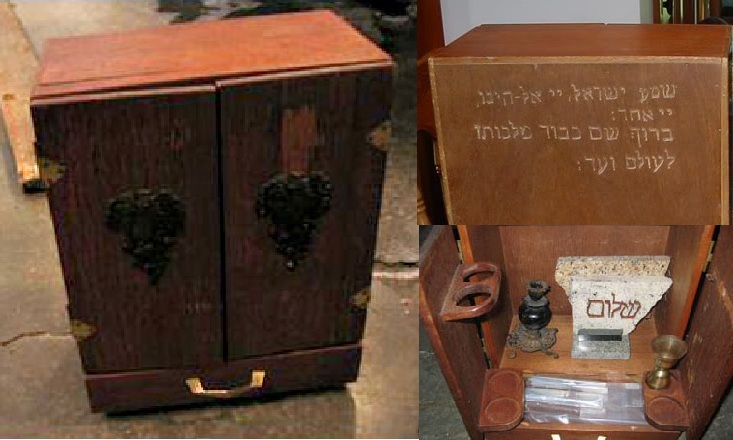 Haxton wrote since having The Dibbuk Box, he had developed strange health problems, including hives, coughing up blood, and “head-to-toe welts”.Haxton consulted with Rabbis (Jewish religious leaders) to try to figure out a way to seal the dybbuk in the box again. Eventually Jason took the freshly resealed box and hid it at a secret location, which he has never revealed. Since then Zac Bagans of Ghost Adventures has spoke to Jason about buying the box off him to have at his haunted Museum in Las vegas, Jason has agreed and Zac has stated that he will not be opening the box and to view it you will need to be over 18 and will need to sign a waiver. Sean Robinson is the owner of this eerie painting. Sean reports that he had inherited the painting by his grandmother, she said the painting was evil and kept it in her attic. Sean’s grandmother told Sean that the painting was painted using the artist’s own blood and that after painting it had killed himself. She stated she had heard voices and crying coming from the painting when displayed and that a shadow figure had been spotted. 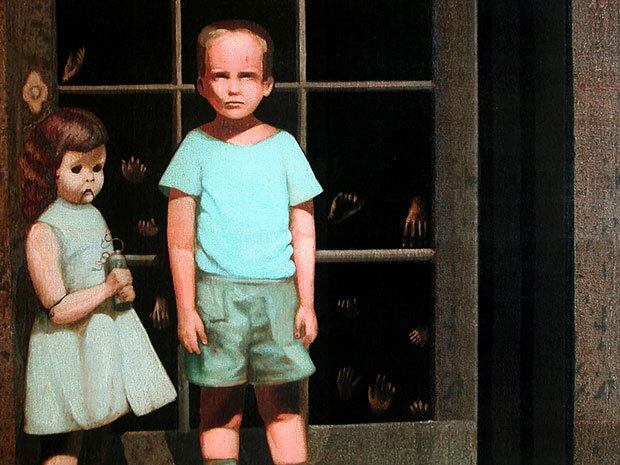 Sean took the painting home, he and his family started witnessing activity, his son fell down the stairs, his wife felt something stroking her hair, crying was heard and a shadow man was seen. Sean set a camera up overnight to try and capture the strange goings on. Sean’s videos are available to view on youtube and these videos show doors slamming, smoke, the painting falling over, a figure cross the camera and strange sounds. Sean took the painting out the house and it is now kept in storage. Sean will not sell the painting and its to my understanding that a film is being produced to document the story of it. Its worth noting that after visiting the painting two weeks to the day two of our team members became ill, one actually being hospitalised for some time. Would this have happened still even if the team hadn’t been to see the painting who knows but Sean did state during the documentary that people had reported becoming ill up to two weeks of viewing the painting. The Poltergeist House. LIVE Paranormal Ghost Investigation – Rotherham – This Friday 7pm UK. This Friday Paranormal Magazine Will Be Streaming A LIVE Ghost investigation at 7pm. UK. 3pm USA Est. What will happen on the show? We will find out what’s been going off within the house, also we will find out what the team plan on doing on tonight’s investigation, Plus we will be streaming the investigation LIVE, for all of you paranormal fans.